Way Too Poor Fielding By Qalandars. Common Qalandars Up Ur Game. hi friend after long time.. how r u all?? While Karachi is being lucky. Qalandars being pathetic... 5 catches r a crime punishable by a defeat.. I think so Lahori Players are having holes in thr hands. Beat #LahoreQalanders or Go Home! 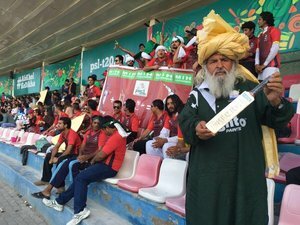 Looking at crowds today, I think finally after few close games, PSL fever is catching on..